Crisps are one of the foods that I’m attempting to give up as part of my new year’s resolutions. Not crisps specifically, I’m just trying to eat a bit better, get a bit fitter, and generally be a better person in every single other way (that’s what new year’s resolutions are for, right?). I’m sure that in a couple of weeks, crisps will once again begin to make semi-regular appearances at lunchtime, but I always think that even if your new year’s resolutions only stick for a couple of weeks, that’s still two weeks of goodness that wouldn’t have otherwise occurred. Every little helps! 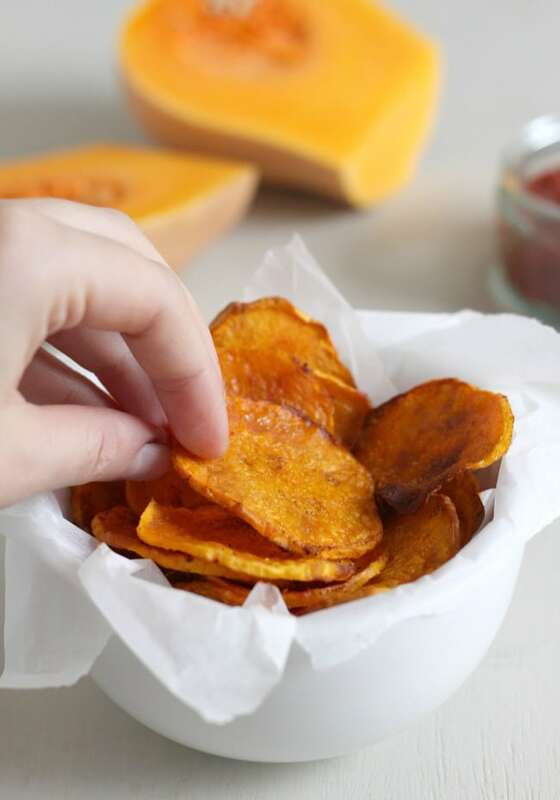 Until then, these butternut squash crisps make a great alternative to the potato version. 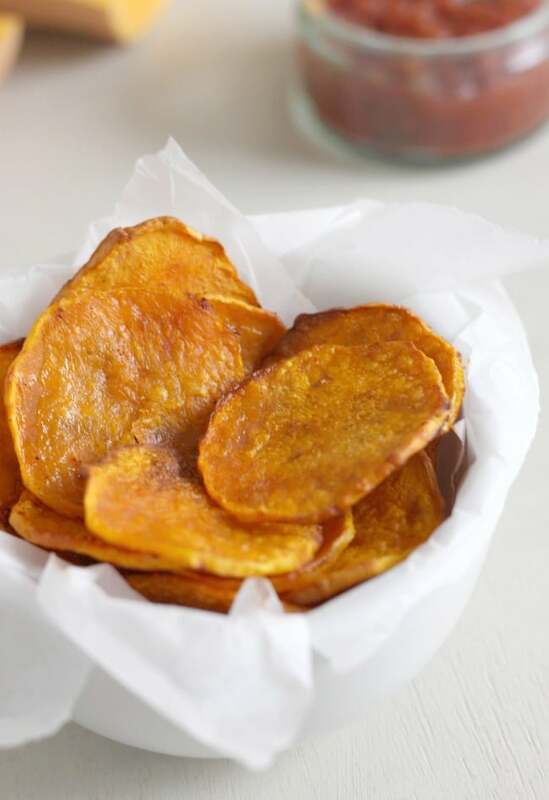 Since they’re baked not fried, you can use minimal oil, making these more of a healthy side dish than a greasy snack (finally, crisps alongside my dinner is totally appropriate!). And although potatoes do contain plenty of nutrients themselves, butternut squash is arguably even healthier. Per 100g, butternut squash has fewer calories than potato, less carbs, and more calcium (along with a few other differences!). Cut the butternut squash in half crosswise, just above the bulbous end (see photo). Set aside this end (save it for another recipe), and peel the narrower half. Cut the flesh into very thin discs (I used a sharp knife, but you could use a mandoline if you prefer). Try to cut them as evenly as you can. Since my squash was quite long and thin, my discs were all a similar size and shape - but if your squash was wider, you can cut some of the discs in half to make them a more suitable size. 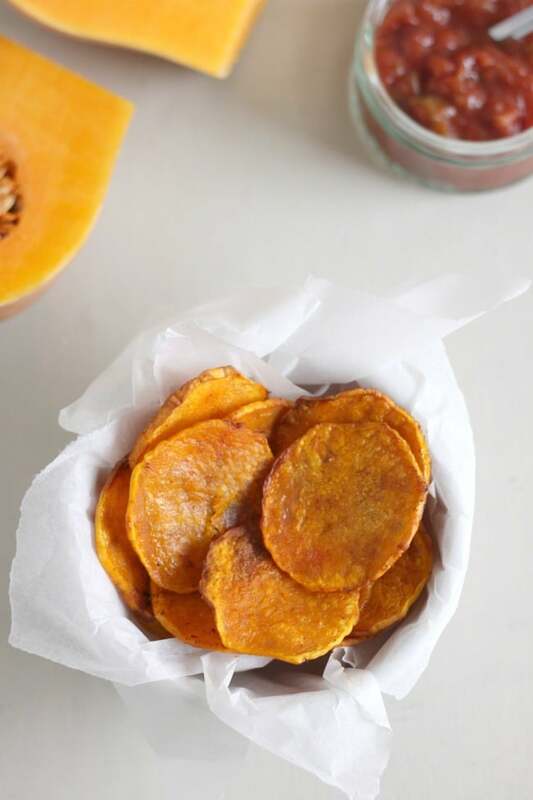 Toss the butternut squash discs in the oil, and lay them out on a baking tray (a single layer is preferable, but they can overlap a little if they need to). Sprinkle with the paprika and some salt and pepper, and roast for around 20 minutes. Turn each piece over, and arrange them again into a single layer - I also moved some of the pieces from the edge of the tray, which had crisped up more quickly, into the centre. Return to the oven for another 10 minutes, or until crispy. Leave to cool before serving. 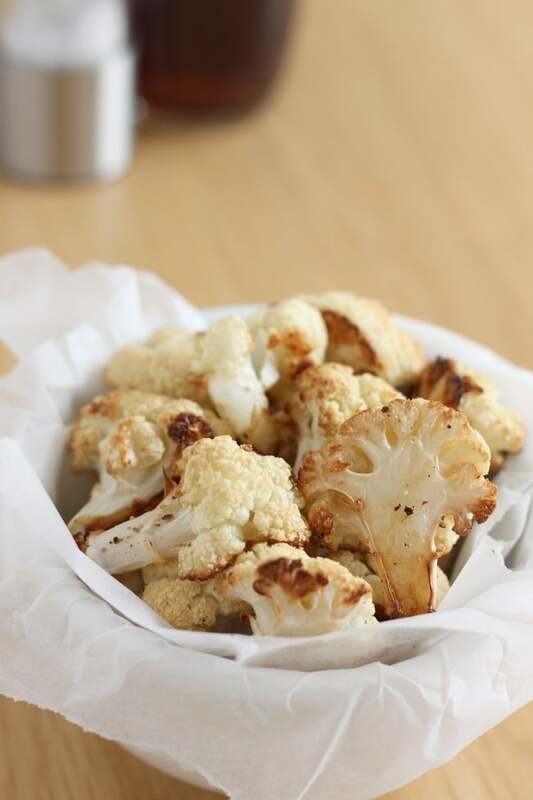 Here’s another healthy vegan snack – salt and vinegar roasted cauliflower! 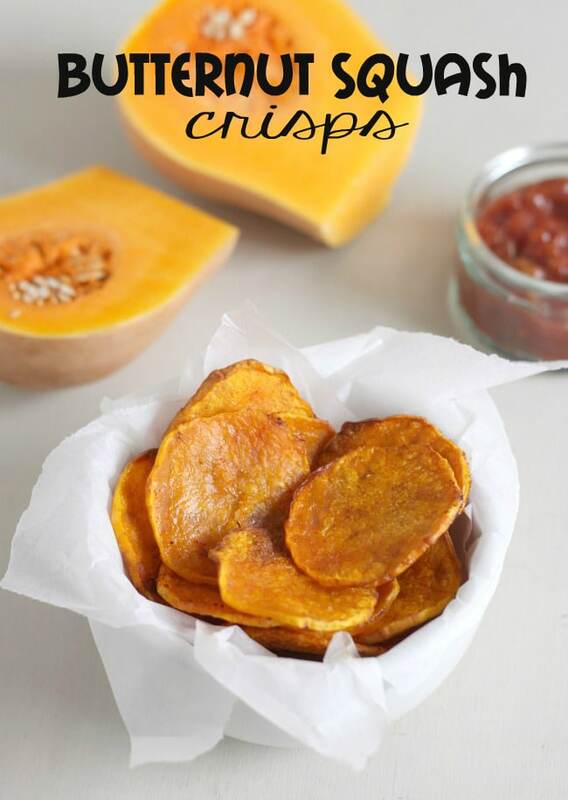 I love vegetable crisps and usually use carrots, parsnip and beetroot for a colourful mix. Butternut squash is a veggie that I often forget about, so thank you for the reminder. I must give this a go because like you I am very partial to the crunchiness of crisps ( a bit too partial if you get my drift!). This look SOOOOO GOOOOD, but I am currently living in Mexico and we don´r have butternut squash, any recomendation? Oh, yum! I could make these for lunch tomorrow using my Whizz Pro. Speedy and yummy. I’m definitely going to! These look fantastic. I’ve thought about this and these look like they’ve turned out so well. Yum! What a great idea! I love vegetable crisps and I actually prefer them to normal crisps. Sweet potato crisps are the way forward I think. Going to give these a try too though. Your recipe is so tempting! I really need to try this!! They do look good. Have you ever tried kale crisps, which are supposed to be easy and healthy? My son-in-law served me kale on Christmas Eve, me having successfully avoided it until then, and although it was quite edible, I actually thought it would be nicer as crisps…. I’ve only had kale chips once, they were shop-bought ones and I really didn’t like them :( it was just like eating air, I need something a bit crunchier! But maybe I just had a bag kind! These look tasty, butternut is probably my favourite vegetable! These crisps sounds delicious. I think that they might work well with a vegetarian curry! 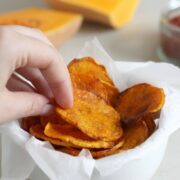 You know if you do not have access or an inclination to make or buy poppadoms…or serve them alongside poppadoms to dip in chutney’s and curry dishes…..Sweet potato crisps might also work well. I think that the home made veggie crisp tends to work better then those ones in packets that tend to be shriveled looking with a too dry even slightly burnt taste to them….I am probably offending some manufacturer of veggie crisps now so I will desist! Yum! I’d never have thought to make crisps from butternut squash and you make it look so easy, and so delicious! !